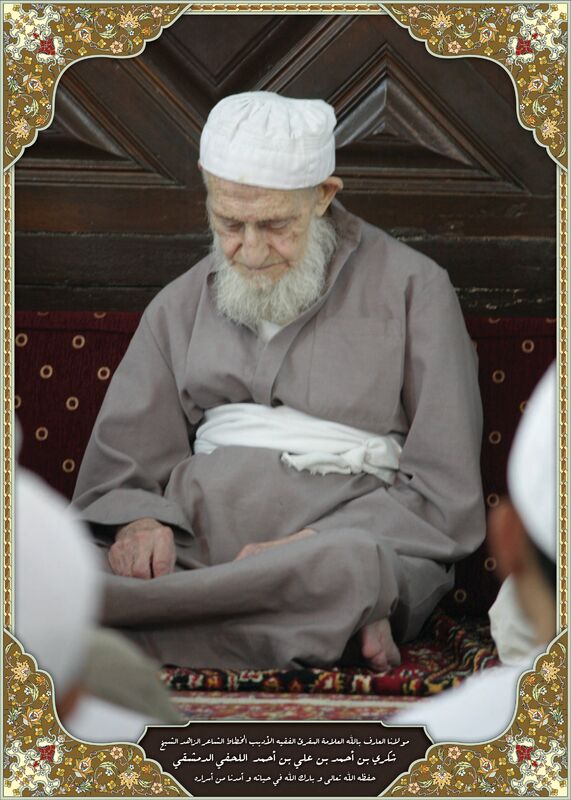 The erudite ‘Allamah, the Gnostic, Zāhid and Friend of Allah, the noble Shaykh Shukri al-Luhafī al-Hanafī ash-Shadhili from Damascus has passed away today, he was 98 years old, He was the Leader of the Shadhili Tariqa in Shaam ash-Sharif. Inna lillahi wa inna ilayhi raji’un. May He give him to drink from the Basin of His Prophet (alayhi salat wa salam), that he may never thirst thereafter, and may He enter him into the highest gardens of Paradise! Ameen. Note that any religious knowledge unattainable through ijtihad and authentically conveyed from one of the Companions is considered a hadith by the experts of that science. The erudite ‘Allāmah, the noble Shaykh Shukrī ibn Ahmad ibn ‘Alī ibn Ahmad al-Luhafī al-Hanafī is a renowned teacher of Qira’āt, a faqīh (jurist), a linguist, a calligrapher, a poet and an ascetic. He is also the current Shaykh of the Shādhilī-Darqāwī-Hāshimī tarīqa of Shaykh ‘Abd al-Rahmān al-Shāghoūrī (d. 2004), after the passing of Shaykh Mustafā al-Turkmānī (d. 2006), may Allah be pleased with them both. Shaykh Shukrī was born in the Al-Qanawāt District of Damascus, Syria in 1920 CE (1338 H). He grew up in the care of both his parents. His father worked as a shoemaker and was a wise and extremely tolerant man. His mother was a pious woman descended from Algerians who settled in the Levant (al-Shām). His family originated from the Turkish city of Kalas, near Aleppo. Shaykh Shukrī completed his primary and junior high school education in 1944, and then completed his high school education four years later. He began memorizing the Qur’ān when he was nine years old. He continued his Islamic studies at the Faculty of Sharī’a in the Damascus University established by Shaykh Tāj al-Dīn al-Hasanī, son of the great Muhaddith, Shaykh Badr al-Dīn al-Hasanī, may Allah be pleased with them both. Shaykh Shukrī worked as a teacher in various primary schools located in Aleppo, Daraa and Damascus. He also served as the principal of a school in the Ashrafiyya Valley of Damascus for a period of two years after which he was transferred to various different education directorates within Syria. Shaykh Shukrī is fluent in Persian (Farsi) and even taught it. He organized courses for memorizing the Qur’ān for both male and female teachers. Students also benefited greatly from his experience and proficiency in Arabic calligraphy. Among his teachers in Arabic calligraphy were: Ustādh Mamdūh al-Sharīf (d. 1935), Ustādh Muhammad Badawī al-Dirānī (d. 1967) and Ustādh Hilmī Habbāb (d. 2000), may Allah have mercy on their souls. Shaykh Shukrī married a sharīfa from the noble Al-Hasanī family and was blessed with four children, he went for the Hajj only once. Shaykh Shukrī read the Ten Qira’āt in the way of Shātibiyya and Durra with Shaykh Yūsuf Abū Dayl, may Allah be pleased with him, and received the ijāza from Shaykh Abū al-Hasan al-Kurdī (d. 2009), may Allah be pleased with him. He also received the ijāza of the Ten Qira’at in the way of Shātibiyya and Durra from Shaykh Kurayyim Rājih, may Allah preserve him. He memorized the entire Qur’ān with Shaykh ‘Izz al-Dīn al-’Irqsūsī, may Allah be pleased with him, and was given the ijāza of the riwāya of Hafs from ‘Āsim. He read the Arba’īn of Imām al-Nawāwī with Shaykh Abū al-Khayr al-Maydānī (d. 1960), may Allah be pleased with him, and was given a general ijāza. He also received a general ijāza from Shaykh Lutfī al-Fayūmī, may Allah be pleased with him. He read Fiqh and the Arabic language with Shaykh Mahmūd al-Rankūsī (d. 1985), may Allah be pleased with him. He read Tawhīd with Shaykh ‘Abd al-Rahmān al-Shāghūrī, may Allah be pleased with him. He read Hanafī Fiqh with Shaykh ‘Abd al-Hamīd Kīwan, may Allah be pleased with him. He took Tasawwuf from the hands of Shaykh Muhammad al-Hāshimī (d. 1961) when he was still at a young age. In 1966 CE (1385 H) he began preparing his book titled Tu fat al-‘Asr fī ‘Ilm al-Qira’āt al-Mutawātirat al-Ashr. In the book he mentioned the ten Qurrā’ and their respective narrators and the variations in the recitations. Shaykh Shukrī advised anyone who wished to memorize the Qur’ān to repeat the intended portion before going to bed, and to read it again after awaking. The person ought to try and set aside a portion to be read daily, or he may otherwise recite it with other people. Shaykh Shukrī is an esteemed ‘ālim, though more known for his humility, gentleness and asceticism. It has been said that he is the embodiment of Shaykh Muhammad al-Hāshimī, may Allah be pleased with him, who, when alive, was the most humble ‘ālim in Damascus. Since the time of Shaykh ‘Abd al-Rahmān al-Shāghūrī, may Allah be pleased with him, Shaykh Shukrī has always been seen serving water to the attendees of the Shādhilī Hadras. He still does that to this day even when he is the Shaykh of the majlis. He has also been seen picking up scraps of food in the market and arranging shoes in front of mosques, something which Shaykh Muhammad al-Hāshimī was famous for. He has the habit of constantly looking down towards the ground so much so that his neck bone has become crooked. He has also never been seen wearing more than two or three different types of clothing, and once, he only broke his fast with raisins when he did a 40 day fast. We would like to thank Sidi Abu Isma’il, Sidi Abu Layth Ibn ‘Ata, Sidi Abdul Khafid, Sidi Ismail, Sidi Faqir, Shaykh Shoayb Ahmed, Sidi Abul Wafa, Sayyiduna Sayyid Shaykh Muhammad al-Yaqoubi and the others that have shared pearls regarding the Late Shaykh as well as photos and videos of the Shaykh. Inna lillahi wa inna ilayhi raji’un. May Allah Subhana Ta’ala give him to drink from the Basin of His Prophet (alayhi salat wa salam), that he may never thirst thereafter, and may He enter him into the highest gardens of Paradise! Janat-Ul-Firedos,. Ameen.Suma Ameen. Reblogged this on Revīve yoūr Deēn. syaikh shukri along with syaikh bouthi condemn terrorist wahabk isis/nusra. with DUA from this syaikh, syria alAssad will win over the dirty war. may Allah blessing all the syaikh of abdal from damascus, the land of blessing..